Real knives are dangerous, these are not movie props, so we do not use movie techniques. The question keeps coming up, do we offer knife disarms? We do not. And I strongly advise people to stay away from any system that advertises and claims to teach knife disarm techniques. i.e. removing the knife from the knife attacker by use of your empty hands. We all understand the logic of needing to separate the knife from the knife wielding attacker. We all appreciate the beauty of techniques as displayed on Hollywood films such as Don't Mess with the Zohan, Surf Ninjas, Kung Fu Panda and Steven Segal movies. Where many people have trouble is in separating movies designed for entertainment from self defense systems designed to help you survive against real life nasty criminals. I am now in Caxias Do Sul, Brazil, where our lovely front desk clerk Victoria laughs out loud when I ask her if she goes out at night. She says that even during the day there are areas in town that she is afraid to go to. This is the sad reality and I am not going to sell her false hope, I am not going to sell her Hollywood techniques. What looks impressive is often false. Her life is too precious, too valuable, and so is yours. But as our man in Singapore points out many people, even professionals, have been conditioned to think in terms of "Knife Disarms": removing a knife from a violent aggressive attacker. As we say in Israel, ata chai be seret. You live in the movies. And unless you are Gal Gadot (Wonder woman) that is a dangerous place to live. Years ago I was in a band (guitar player), it was the 1980's and a certain style of pop music was popular, but not with me. Our manager told us that for certain jobs/parties we needed to learn the top 40s music. I told her that I prefer Blues, Classic Rock, Hendrix, Beatles and Stones. He told me to play that music at home in my living room but for work, for a job, you give the people what they want. This is entertainment. Self defense however is different. 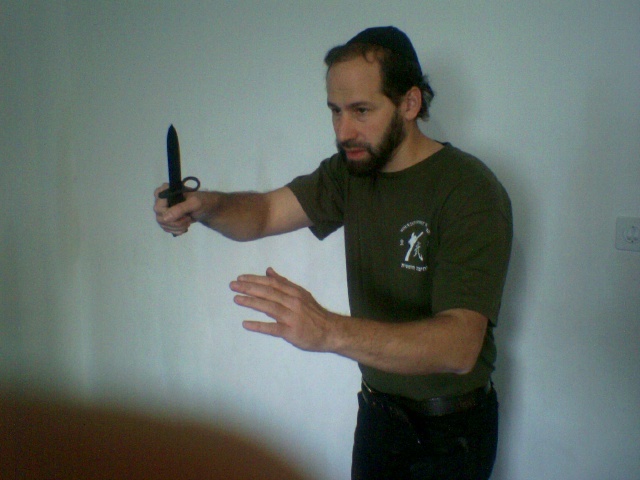 I was teaching a seminar where I was advised to teach some "popular" Krav Maga techniques, crowd pleasers such as come classic well know knife disarms. I flatly refused. No job is that important for me to compromise the integrity of my work. No, I am here to teach you, not to entertain you. I will you give you what you need, not what you want. Krav Maga is not entertainment and I will only give you the truth. I will repeat the words of the legendary Dan Inosanto, top student of Bruce Lee, "Knife disarms are incidental, if not accidental". That means we do not attempt knife disarms, that means they are highly unlikely to work, that means if I attempt the knife disarm I am wasting my time by giving priority to something incidental. And of course it is highly unlikely/impossible to work, (and I am being generous here). By chasing the knife in the hands of the highly motivated attacker I am falling into his trap, I am playing his game and fighting his fight. My priority must not be the knife but to get away from the knife. Depending on the circumstances my objectives might also include disabling the attacker. There are various ways of doing this but none of them include trying to grab his wrist and attempt a "martial arts" disarm. I am not a knife fighter, Dan Inosanto IS and he knows that he is talking about. Train for knife disarms and you are training for an early grave. Train smart, not cool. Join IKI and stay on the cutting edge of Krav Maga. Do not be caught training in "historical" Krav Maga. Stay up to date with daily video updates from Israel.